Have you considered using magnetic strips to store your kitchen cutlery? Or – possibly repurposing a hanging fruit basket to hold office supplies? These ideas might sound strange at first, but these easy organizing hacks can save space, spruce up your place and make a small home look bigger at the same time! Organizing efficiently and implementing great storage tactics will offer more usable area throughout your home, as well as give the rooms a more spacious feel. Follow along to discover eight unique tips that will help make your small home feel larger! Take a quick look around. 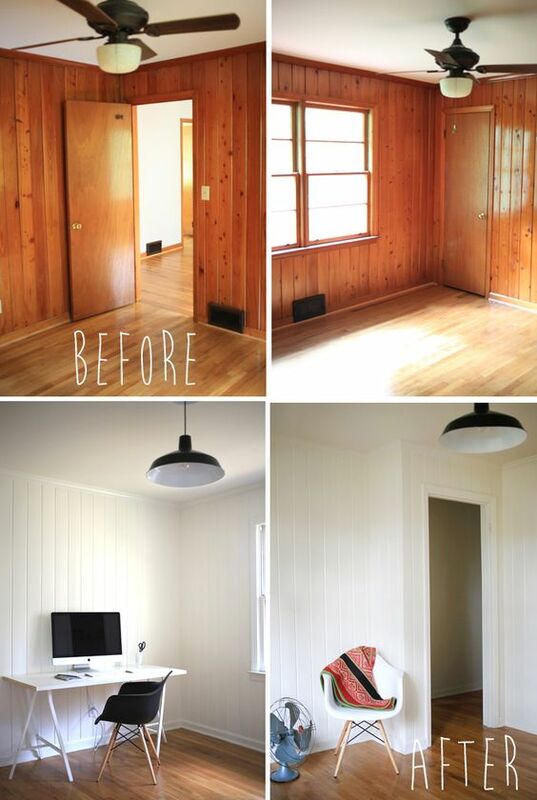 Are the corners in your home empty? They are probably offering you an ample amount of additional storage space that you never realized existed. This is one of the best ways you can make a small home look bigger. Oftentimes we are quick to set up storage units that sit on our floors (and take up space). Or we simply opt for buying another dresser to set up in our room because we have too much stuff, right? Instead of adding more things and more furniture to our rooms, take advantage of storing things vertically. For example, you could purchase a hanging fruit basket to hang up and use it to store socks, scarves, hats, clutches, purses, and more. 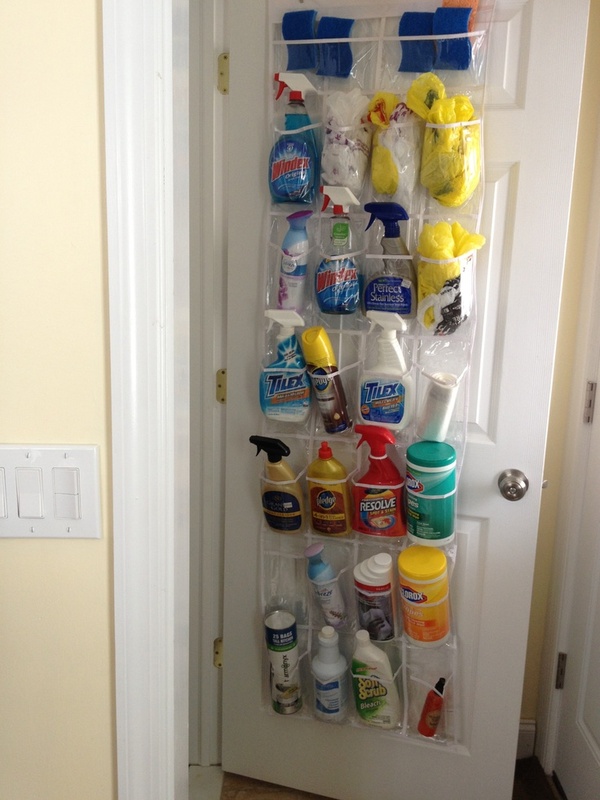 Using an over the door shoe organizer for storing cleaning supplies, shoes, and even office supplies. 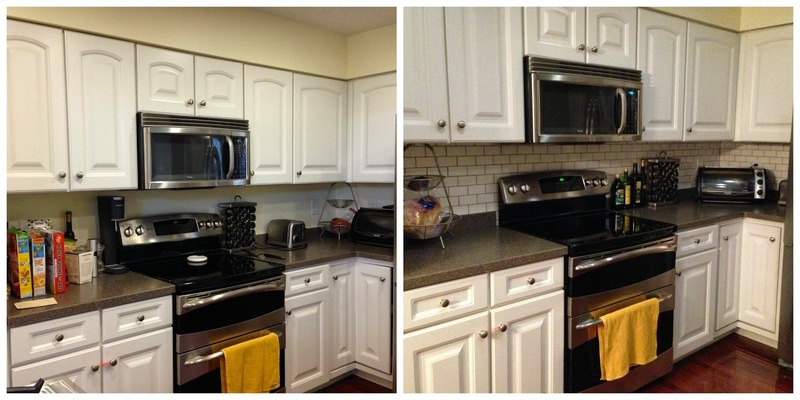 Create more space in the kitchen by hanging your pots and pans, and cutting boards from the wall. Add heavy duty magnetic strips into your kitchen to store your knives for easy access, and to eliminate the big cutlery block taking up your precious counter space. Plus, these magnetic strips can also be used to store tools or even craft supplies. Using pegboards to create more vertical storage works wonders throughout your entire house. Use pegboards in the kitchen to hang commonly used gadgets or hang one up in your bedroom to store jewelry, sunglasses, and more. Less visible clutter will help make a small home look bigger. It’s true. When the countertops in your kitchen or bathroom are filled with clutter, it is hard to make sense of what the counter actually looks like. 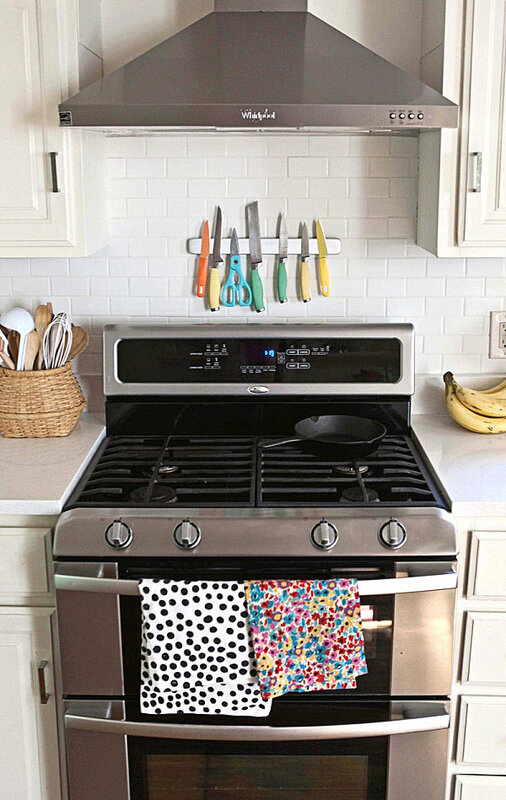 Keep less stuff out on your counters, to give the illusion of more space. Adding ceiling shelves around the top perimeter of your walls (close to the ceiling) will do a couple things for you. First, it will create space for you to show off your home decor, photos, and favorite books. And secondly, it will help create the illusion of taller ceilings and therefore a bigger room. Are you thinking of hanging up a nice, big piece of artwork in your living room? Consider opting for a large decorative mirror instead. Adding a mirror to a smaller room is a great way to brighten up that room and bring some natural light into your rooms. Do you need a home office area? If you are running low on space but do not want to skip out on having your own work desk at home, install a fold-out convertible desk to your home. This storage piece is aesthetically pleasing to the eye, does not take up space, and helps to keep your “office supply build-up” stay at a minimum. When you are not using your desk, simply close it and push that functional accent chair back in the corner! This is another way to make a small home look bigger. Make more space for yourself in your bedroom by eliminating those clunky nightstands. Some of us only need our nightstands for the top surface. We need somewhere to place our phones, nightly reading material, and maybe our glasses too. Install a floating nightstand shelf to free up some of the floor space in your room, and still leave you with functionality. Using lighter paint colors to brighten up a room is the oldest trick in the book… but it works to make a small home look bigger! Lighter colors offer more brightness to a room and contain more reflective properties. Dark colors (especially with dark floors) can make a room feel closed off.